Plan administrators and team managers can add learners to business plans. Business plans are also sometimes called group plans. To add learners to your business plan, please choose from the following two methods. The first method is more automated, and the second method allows for more personalization. As a plan administrator or team manager, from your admin tools dashboard, click the Invite new user link in the top-right corner. Enter the learner’s desired email addresses in the email address field. Alternatively, you can copy and paste the email addresses from a file. Optional: Select the desired team from the team drop-down menu. Click the Send licenses button. You can also see a preview of the email the learners will get. Click the People link in the left pane navigation. Click the Share a link instead? link. Type the desired email domain in the Domain field. 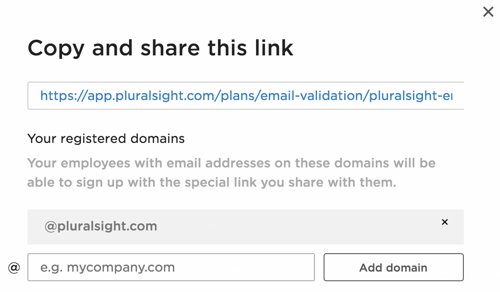 In this example, @pluralsight.com is the email domain. Copy and paste the link into a message in your organization’s email provider, and send the email to the learners you want to invite to the plan. Tip: You cannot enter a note when inviting learners. Notes can be entered for a learner after the invitation is sent. Note: This article does not cover the third method of distributing licenses, which is through SSO or LTI. For assistance with this, please contact support@pluralsight.com or your sales rep. Available to plan admins only: To see who has joined the group plan, click Log in your admin tools left-hand navigation. The Log contains information about license redemption, plan renewals, and team creation, as well as learners who’ve left the plan. Available to plan admins and team managers: On the Organization page, click the Download Users button to find a list of learners and invitations that have been sent. You can cancel or resend pending invitations from this page. The Organization page also lets you organize your learners into teams and create team managers. Note: When you re-invite a learner, the learner's previous invitations are invalidated and the 45-day invite expiration period starts over. My learner got their email, why can’t they log in? We sometimes hear from learners who don’t realize they need to click the Accept invite orange button in the email. This also applies for team managers and plan admins. Until the learner clicks the Accept invite link, they haven’t joined the plan. Additionally, learners may have different experiences after clicking that link, based on if they already have a Pluralsight subscription or not. Click here for an explanation of what happens when learners click Accept invite in different scenarios. My learner already has a subscription. What do I do? You can follow the same invitation process. When they get their email and click the link to create an account, they will have the option to continue with their existing login information. Click here for complete information around accepting invitations. In some scenarios, they will get prompted to contact Support. We have 24/7 support that will get back to your learner to help them cancel their existing subscription and if applicable, get a refund, so they can join your group plan. Please note that we cannot cancel an individual’s subscription except at the individual’s request. Plan admins and team managers cannot request that an individual’s subscription get canceled. My learner already had an account or subscription, and now they’ve made a new account accepting an invitation. Here’s the correct way to accept an invitation for that scenario, which avoids making two accounts for one person. We cannot combine or merge two accounts. What we typically recommend is keeping the learner account with the most viewing history, deleting the unneeded account. If the remaining account isn’t already on the group plan, then invite the remaining account to the group plan. Please contact support@pluralsight.com if you have a learner with two accounts because we can assist with this deletion and re-invitation process. The link in the invitation email doesn’t work. We automatically send reminder emails if the license hasn’t been activated. Each email includes a new link, which invalidates all previous links. Also, please note that invitations expire 45 days after they were sent. Our group plan invitations will give you a one-time-use link to join the plan. If you were able to initially access Pluralsight with that link, please make sure you are logging in through app.pluralsight.com/id. My learner didn’t get an invitation email. Ask your learner to check their spam folder for emails from admin@pluralsight.com. Please make sure you do not have any rules that would route emails from admin@pluralsight.com to your spam folder or immediately delete the email. Click here for whitelisting information. Confirm that your learner was invited into the plan. If you haven’t been able to locate the email, please email support@pluralsight.com with the learner’s name and email address, and we can send your learner the invitation link. Alternatively, in your left-pane navigation, click the People link, and click the Download users button. At the bottom of this CSV, you’ll find the invitation URLs for learners who haven’t accepted invitations yet. You can send your learners their respective URLs, without having to send an email through Pluralsight..
My learner got this error: "Oops! Looks like there's a problem..."
Here are possible causes for this error. They’ve received multiple invitation emails and they’re trying to accept an old one. Solution: Locate your most recent invitation and follow the instructions inside. Each re-issued invitation invalidates the previous one, so the newest invitation has the only active link. They’ve already accepted your invitation and they’re trying to sign in again using the invitation link. Solution: Ask your learner to sign in from www.pluralsight.com/id. Invitation links are one-time use only. Their invitation was issued more than 45 days ago. Solution: Ask the internal plan administrator or team manager to reissue the invitation. Invitation links expire after 45 days. The internal plan administrator or team manager canceled the invitation. Solution: Ask the internal plan administrator or team manager to reissue the invitation. The group plan is full. Solution: Try removing licenses from learners who have left the plan. Or, contact your sales rep to add more licenses to your group plan. My learner got this error: "Sorry! We are unable to set up your company subscription..."
Your learner may get this error if their existing account is tied to another group plan or an active individual subscription, which prevents them from joining the group plan. Solution: On that same error screen, they can click the Request support button, and they’ll receive an email from support@pluralsight.com with instructions for the next steps. f they’ve already navigated away from the error page, please ask them to email us at support@pluralsight.com. My learner got this error: "Personal email is already associated with another account" or " Username is already associated with another account." Solution: Ask your learner to sign in with their existing account's credentials. How do I add a plan administrator? How do I revoke a license or remove an administrator?